Hello, I'm Ally of From the Right Bank and I can't believe it's been four months since Lauren asked me to be guest blog here. Let's see . . . back then, cutie pie Justin was still on the way and I was in the middle of moving across the country from Seattle to Atlanta. Lauren asked for a "Before and After" post and I thought, "Sure, no problem. By April, I'll have lots of Before and After's to choose from." weeks, looking at hundreds of swatches and lying awake at night contemplating just how many shades of gray exist in this world (Doesn't everyone? ), I finally decided on Benjamin Moore's "Trout Gray." 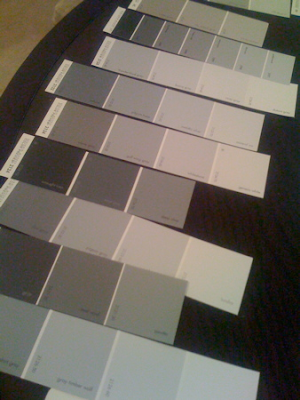 I wanted a true gray - one that wasn't too blue, too green, or too purple and Trout Gray fit that bill. I'm still looking for the perfect sconces to go over the sink and I'll be replacing the faucet as well as the lights over the island but it's close. Now as for the rest of my house, that's another story! and it's been an honor to be your guest! Ally it's so beautiful!!! The gray is perfect and I am seriously jealous!! Thanks for sharing the process with us & can't wait to see the rest of your new house!!!! It turned out so great! The gray is so crisp against the white!! Great job - can't wait to see the sconces you pick out! Oh my .... indeed, the perfect gray! So gorgeous!! Love the dark grey. At the beginning of the story I was expecting another light French grey...what a great surprise when I saw the final finish!!! To divine Ally (and Lauren) this is the first B&A I have seen from Ally's house - nothing on her blog so you are lucky to have it here. It is indeed the perfect grey and works brilliantly. It's a great colour choice. The agonising and sleepless nights certainly paid off!! I am applaunding this update and your commitment to your personal taste!!! It really turned out so well and now the marble looks even more beautiful. What a lovely transformation - Ally has given what was already a nice kitchen a bit of edge, crispness, and character. It looks great. Love the gray. I'm so glad painted cabinets are "in" - it's accessible to anyone with an eye for color. For me, it all started with Sally Wheat. I love the neutral gray color... so soothing! Nice to see you over here as well! Gorgeous! I love the gray with the warm countertops! Wow what an amazing transformation. It looks great! The cabinets turned out better than great - they are fabulous. Thanks for sharing. And I love the name - Trout Gray. The gray is really lovely. The cabinet style looks a little different... is there a space above the doors on the upper cabinets? When I saw the "before" I was thinking "Gosh, I wish my kitchen looked like that!" but your risk with the grey really panned out. It's really beautiful and you were right to break up the monotonous beige. Lovely! Thanks for all the lovely comments, everyone! And thank you again, Lauren, for having me. As for the faucet, I just had it replaced yesterday and had the old one taken away. If someone needs it, I could probably get it back. :) I'll post some photos of it tomorrow. Debbie: Yes, there is some space between the top of the cabinets and the ceiling. Hmmmmm. Thanks Ally and Lauren for the inspiration. Debbie: I just re-read your question. Yes, there is space above the doors on the upper cabinets. For years I had been all about white kitchen cabinets - but lately, I think gray cabinets are just SO cool. Excellent change! Thanks for sharing with us! Just beautiful. I love the gray. Can't wait to see the rest of your new house. How beautiful! When I saw the before pic, I wondered why you would choose to change such a pretty kitchen! But those grey cupboards are fab!! It really makes the space pop and makes it much more chic! gorgeous! Wow, what a HUGE difference. It looks so much more lux now. I am always amazed at how grey or gray ;-) can appear to be warm, cozy, and peaceful, who knew? how can you not love grey cabinets?! Love the gray.....but I agree about those faucets. They look perfect to me. the gray cabinets are perfection! Its gorgeous Ally! Even your little view from the window, all of it! Now show us more, more, more!!! My goodness, I must paint something gray!! That looks amazing!! Ally, it's perfect!!! YOur hunt for the perfect shade definitely paid off! I am so stuck on having an all white kitchen that I forget that other colors can look amazing too! Love the window in the kitchen! OK, I have to say that you turned a gorgeous kitchen into another gorgeous kitchen! I want it. When I first saw the before picture I was like, what is she going to do with those they look great. And then I saw the after and I am just floored! They look amazing, what a perfect color- they are beautiful!! The color choice was definitely worth all of the sleepless nights. Subtle, yet dramatic, that amazing gray brought your kitchen to life. My only complaint-MORE, please. Such a fan! I love this look, and I also love that it's different. It just doesn't resemble every other kitchen out there. Nice job! What is not to love? It is stylish, chic, classy and beautiful. I love the gray color you chose and would be willing to give up sleep for weeks in a row for a kitchen like that! I am with NKP - more, more, more! Ally and Lauren - you both rock! I love Ally's work, the kitchen looks fabulous! I would never have thought of gray -- but they look gorgeous! oh my, its gorgeous! Ally you blow me away. i love the color of the cabinets! great job! !